Washington, DC June 22nd & 29th – Wanda Spence, great niece of nationally & internationally renowned artist, educator, curator, and advocate Delilah W. Pierce, has been selected to play Judge Harrison in A Change Is Gonna Come written by award-winning playwright, Vickie L. Evans. A Change Is Gonna Come is a true-to-life depiction of domestic violence and its judicial consequences. 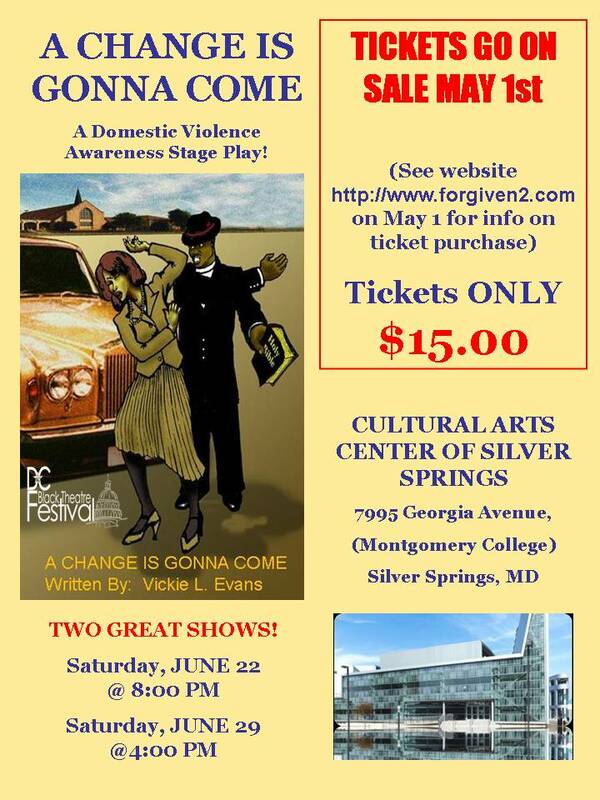 A Change Is Gonna Come is running Saturday, June 22 at 8:00 pm and Saturday, June 29 at 4:00 pm, at the Silver Spring Cultural Arts Center. Order tickets at http://www.eventbrite.com/event/6517924287/es2. This is a case of art imitating life for Wanda Spence, a survivor of 20 years of spousal abuse. Wanda will also bring Judge Harrison to life with objectivity, passion, and a sense of purpose. 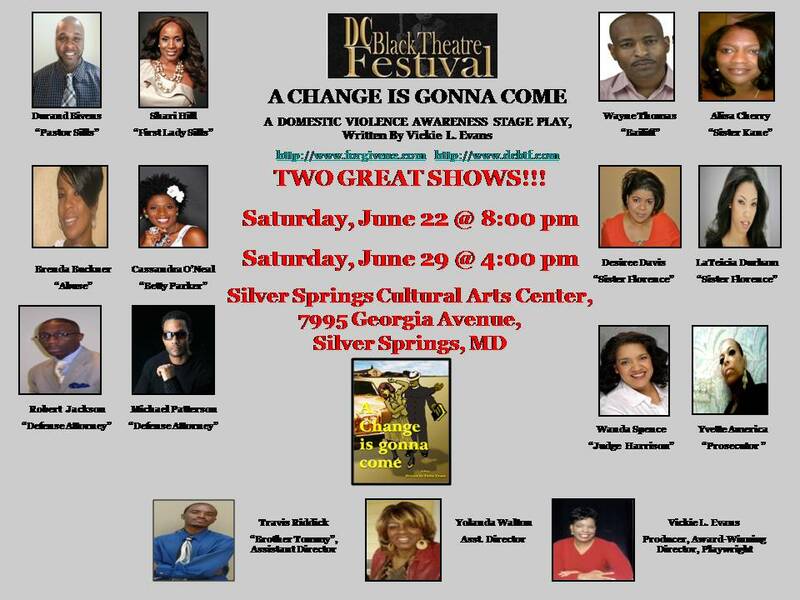 A Change Is Gonna Come is running in the DC Black Theatre Festival, with two shows: Saturday, June 22 at 8:00 pm and Saturday, June 29 at 4:00 pm, at the Silver Spring Cultural Arts Center. Winner of FOUR Velocity Magazine Awards, A Change Is Gonna Come is the true-to-life depiction of domestic violence, hidden behind the walls of a church…at the hands of a least-likely suspect – A Pastor! First Lady Lisa Sills, a beautiful, intelligent, and dedicated wife, portrays the image of a blissful pastor’s wife in the public eye; while secretly being violated, manipulated, and robbed of her self-esteem “behind closed doors”. This emotionally-charged dramatization is captivating, heart-wrenching, eye-opening, revealing, explosive, mysterious, and entertaining! It will make you laugh, cry, sigh, and applaud the outcome! STELLAR performances by a Tri-City combined cast from Washington, DC; Charlotte, NC; and Philadelphia, PA. Although the background of this dramatization centers around the church, A Change Is Gonna Come conveys a UNIVERSAL message…that domestic violence can and does happen to ANYONE (celebrities, musicians, lawyers, doctors, men, women, teens, etc.). NO class of people or race is exempt! You will witness the agony of entrapment; the generational transference of abuse passed down from the father to the son; a mother’s internal anguish; a SURPRISE revelation; a courtroom controversy; and so much more! It will keep you on the edge of your seat! A Change Is Gonna Come mission is NOT to ostracize or embarrass; our goal IS to provide a non-threatening visualization that will open opportunities to invoke training, counseling, intervention, and prevention between clergy and congregants, in anticipation of restoring healthy families, and rebuilding strong churches and communities.